I met up with Elizabeth Mast at 5803 Swiss Avenue, the beautiful brick home where Neiman Marcus founder Carrie Marcus Neiman lived her last days. This home built by Carrie Marcus and her then husband, Abraham Lincoln Neiman, which sits at the corner of Swiss Avenue and Skillman, may not have the columns and beams of some of the other Swiss Avenue estates, but it has its own subtle presence that melds very well with the brand of its original owners. The home was purchased by its previous owner from the estate of Carrie Marcus, Mast told me, and now it’s being sold by that person’s estate. So if you’re keeping track, that means that this four-bedroom, four-full-and-one-half-bath home with more than 5,100 square feet has only had two owners. Isn’t that incredible? The home has seen some renovations over its 93 years, most of them during the 1950s. 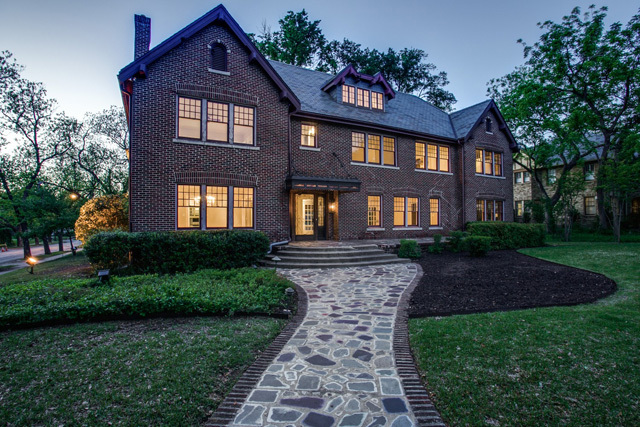 Mast, who specializes in the Swiss Avenue Historic District and has another fabulous listing at 6243 La Vista (the Stubbs Home, if you recall), does a ton of research on all of her listings, and was able to dig up some old photos of this home’s interiors. Jump to take a look back in time!